CONCORD, NC - After keeping a careful watch on Hurricane Irma, as well as staying in constant contact with Atlanta Motorsports Park Officials, World Karting Officials are moving forward with this weekends Grand National event for the Dunlop/Xeramic National Road Race Series presented by Russell Karting at Atlanta Motorsports Park in Dawsonville, Georgia. Downgraded to a Tropical Storm earlier this week, as of Tuesday morning, the system began moving out of the state of Georgia, slowly losing energy with each passing day. The end result for the track was steady rain the past couple days, with winds measuring no more than 30mph, which, according to AMP Officials, is no different than their average wind during a normal storm. With the bulk of the storm now gone from the Dawsonville area, the future forecast calls for cloudy skies Wednesday, with temperatures in the mid- seventies, while the weekend forecast will feature sunny skies and temperatures in the mid-eighties all weekend long. Officials were concerned just as much with the track of the storm, standing in the way of competitors traveling to the venue, as they were of the impact of the storm at the facility itself. With the weekend weather threat now in the rearview mirror, it will be business as usual for the series, with the weekend scheduling staying the course. As mentioned in a previous Pit Board however, the Thursday schedule will be modified, due to another customer being on the track until 7pm that evening, thus moving parking and registration back a few hours on that day, until the registration building and south paddock are vacated. As was the case last year, customers arriving early may stage in the north paddock area, or be parked, if they choose to be in that area, which will be available to WKA all weekend long, as it was last year. Friday activities begin with a full day of practice beginning at 9am, with on track activity both days beginning at 9am as well. Anyone wishing camping or power for the weekend need to contact the track directly. To view the weekend schedule for the Road Race Grand Nationals, CLICK HERE. Garland Notches Impressive 3 Wide Win at VIR!!! CONCORD, NC - Scorching temperatures in the triple digits all weekend long did not deter a packed paddock area at Virginia International Raceway from putting on some of the best racing of the season to date, as the Dunlop/Xeramic National Road Race Series presented by Russell Karting hosted the Summer Nationals, stop #4 of the 5 race national program. Clearly leading the way in the competition category was the Hoosier Racing Tire Animal Heavy Class. Scheduled for a 30 minute session on track Saturday, the top 6 karts in the class ran nose to tail, swapping positions constantly for the entire 30 minute period, with the end result a 3 wide finish, with Darlington, South Carolina's Rob Garland nipping Jonathan Tedder by 0.001 seconds at the stripe, and midwest invader Regan Vehring 0.050 seconds back in third!!! While 6 karts were part of the battle for the better part of the race, the top 3 edged away in the final laps, with Tony Wimmer, David Clevenger, and Robert Garland completing the top 6. Day 2 action for the Animal Heavy Class found Vehring snaring the win over Ben Thomason, Robert Garland, Clevenger, and Rob Garland. Packed classes were the order of the weekend, with Pascual Torres taking down the Fisher Racing Engines Stock Honda Class Saturday, besting Sky Finley, Stevn Rougeou, Aamir Hyder, and Benjamin Eberhart. Day 2 found Finley improving 1 spot in the order for the win, with Eberhart, Torres, Hyder, and Collin Johnson making up the top 5. Jason Lorang was up to his usual grueling weekend schedule, as the midwest ace topped the West Texas Outlaws TaG Heavy field on Saturday, turning back Gary Sircy, Ashley Michel, Brad Adams, and Charles Speacht. Brad Adams took the Day 2 TaG Heavy action, topping John Bryant, Gary Sircy, Ashley Michel, and Lorang. Lorang also dipped in to the ultra competitve CKI Yamaha Sportsman Medium field, chasing eventual winner Nate Grindell, Chad Dokken, and Tim Linthicum across the stripe in Saturday action. Brandon Schenkel made up the top 5. Sundays Yamaha Sportsman Medium action found former champ Matt Michel back on top, taking the top honors over Bill Holder, Schenkel, Lamar Hilliard, and Simon Whitnell. The WT Racing IAME Sprint field was also jammed this past weekend, with AJ Ellis drawing first blood on Saturday, taking down Greg Heberle, Clark Gaynor Jr, Travis Waddell, and Sebastian Bushey. Gaynor rebounded on Sunday for the win, besting Ellis, Heberle, Tiffany Fisher, and Waddell. The Yamaha Sportman Heavy field was also loaded with immense talent, with Illinois ace Randy Fulks sweeping the weekends action, first besting Sean O'Shea, Scott Clark, Bill Holder, and Brandon Schenkel on Day 1, while O'Shea, Chad Dokken, Nate Grindell, and Scott Stauffer made up Sundays top 5. Derek Somers also pulled out the broom over the weekend, taking the WKA Sprint finals both days, besting John Leins, James Leins, Louie Magiera, and George Lincoln on Day 1, while James Leins, Magiera, and John Leins chased Somers on Sunday. Travis Miller also pulled the broom out of the closet as well. Following engine issues at Summit Point, Miller stormed back to sweep the Millers Dynotime Racing/KALL Racing Formula 100 class, besting Lance Yunck, Ian Morgan, Dennis Griffith, and Jason Lorang on Day 1, while Morgan, John Scavuzzo, Yunck, and Kristina Griffith completed the top 5 on Sunday. All eyes are now focused on the season ending Grand National event at Atlanta Motorsports Park in Dawsonville, Georgia Sept 15-17, to determine the 2017 national champions. The challenging road course with awesome elevation changes will provide the perfect backdrop for the culmination of the 2017 national racing season. Entry information for the Grand National event will be out by weeks end. All classes offered at the last two events, including Local Option, will all be made available at the Atlanta event. On behalf of the World Karting Association, our sincerest thanks to Rodney Smith and the entire Woodbridge Kart Club staff for an excellent weekend, enduring some most brutal temperatures. Summit Point Entry Blank Now Available! CONCORD, NC - The first of 2 events on the National Road Race calendar for the Woodbridge Kart Club is right around the corner, as the entry blank for the Summit Point Nationals, scheduled for June 3 and 4 for the Dunlop/Xeramic National Road Race Series presented by Russell Karting is now online. The Summit event will mark the third event for the national road race series, with stop #4 taking place July 21-23, as the series makes a return to Virginia International Raceway, also a WKC event for WKA, followed by the season ending Grand Nationals September 15-17 at Atlanta Motorsports Park in Dawsonville, Ga.
Online information for the Summit Point event is now available by either viewing the entry blank on the WKA site, or going directly to WoodbridgeKartClub.com. Just like the Roebling Road event, all entries will be processed through the Woodbridge Kart Club site. The entry blank on the WKA site is simply a viewing tool, giving competitors an opportunity to see the national and local option classes available. Many of the WKC local option classes include 4 different Vintage classes, including Vintage USA, Vintage Euro, Vintage Open, and Vintage Piston Port. On the national side, many local option classes are being offered, including Cadet LO206, Junior LO206, CIK LO206 Senior, Open Sprint, and TaG Junior. Activities for the Summit Point Nationals begin on Saturday June 3 with practice at 8:30am, followed by a full day of competition. Sunday will be a busy day as well, again with a full slate of racing. While the June Summit Point event will not host a Friday Practice Day, competitors will be allowed to enter the facility at 6pm that day to begin set up and preparations for the event. It is important to note that gates for all, including WKC Staff, will not open till 6pm, as per Summit Point Motorsports Park Officials. So be sure and plan your travel accordingly. WE WANT MORE ROAD RACER SPOTLIGHTS! That's right. We want more Road Racers to be featured on our #RaceLife Spotlight and would like to extend the opportunity to showcase more of this series' talented drivers! Do you want your son/daughter or yourself to be featured across social media and on the World Karting website? Email us at shift.counseling@gmail.com to receive your interview questions today. 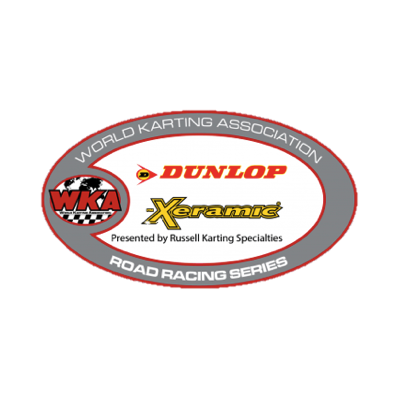 CONCORD, NC - The deadline for pre-entries for the second race of the Dunlop/Xeramic National Road Race Series presented by Russell Karting is fast approaching. Competitors wishing to take advantage of the final pre-entry price for the Road Race Nationals at Roebling Road Raceway in Savannah, Georgia March 10-12 have until Tuesday March 7 to submit their entry. After that, At Track pricing will go into effect. Pre-Entry Forms may be filled out by using MotorsportReg.com, which is available on the Southern Kart Club website, www.southernkartclub.com. The weekend event at Roebling will also include the 2016 Year End Awards Presentation Friday March 10, being held this year at the Art Gallery at the National Museum of the Mighty Eighth Air Force, right on the track exit. Doors to the function will open at 7pm, with dinner at 7:30 and the awards presentation beginning at 8pm. A full buffet dinner, consisting of green salad with all dressings, baked boneless chicken breast with herb seasoning, sliced roast beef, green beans, mac and cheese, mashed potatoes and gravy, rolls, banana pudding, apple cobbler, sweet and unsweet tea will be provided. Be sure and get your entry in for the Roebling Road Nationals, as well as your reservations for the awards presentation, as WKA honors the 2016 national champions, as well as many other award recipients. To view the 2016 Year End Awards Banquet Form, CLICK HERE. CONCORD, NC- Competitors gearing up for the second race of the season for the Dunlop/Xeramic National Road Race Series presented by Russell Karting, scheduled for March 10-12 at Roebling Road Raceway in Savannah, Georgia have just 1 week left to take advantage of the Tier 1 Pre-Entry pricing. The deadline for Tier 1 is slated for Friday February 17. Between now and that date, competitors can take advantage of the $90 pre-entry price. After the 17th, the Tier 2 pre-entry pricing will move to $100 per class, with that deadline in place until March 7. After that, At Track pricing will kick in. Pre-Entry Pricing for the Cadet Class remains at $65 through both pre-entry tiers. Those wishing to pre-enter for the event can either download the WKA Entry Blank, or fill out the pre-entry form using MotorSportReg.com, of which a link to the event page is available at www.southernkartclub.com. It is important to note that ALL entries are processed through the MotorSportReg.Com site, as no entries come to the WKA Office. In addition to the Roebling Road Nationals, those wishing to attend the annual Year End Awards Presentation Friday March 10 need to fill out their Awards Banquet Reservation Form, and return it to the WKA Office as soon as possible. This year’s awards presentation will be taking place at The Art Gallery at The National Museum of The Mighty Eighth Air Force, located right on the Pooler, Georgia exit, same as the track. The festivities will take place following Friday practice, with doors opening at 7pm, dinner at 7:30pm, with the awards presentation beginning at 8pm. A full buffet dinner, catered by Barnes Restaurant and Catering will feature Green Salad with all dressings, Baked Boneless Chicken Breast with herb seasoning, Sliced Roast Beef, Green Beans, Mac and Cheese, Mashed Potatoes and Gravy, Rolls, Banana Pudding, Apple Cobbler, with Sweet and Unsweet Tea. Cost for the buffet and awards ceremony is $35 per person. The Hall seats 120 people. So, make your reservations now!!! To view the Year End Awards Ceremony Form, Click here. CONCORD, NC - The latest edition of Daytona KartWeek was successful to many in so many ways, one of those being the folks at Competition Karting Inc. For many years, CKI has been the dominant chassis in Road Race competition. And following Daytona KartWeek, the Welcome, North Carolina chassis manufacturer is well on their way to reaching that same goal again in 2017. At the conclusion of the first event of the season for the Dunlop/Xeramic National Road Race Series, presented by Russell Karting, CKI holds a commanding 14-win edge over the rest of the competition, as a result of their 18 victories in the season opener at Daytona. While it’s a big gap from first to second in the standings, it’s a literal log jam from 2nd on back, with both MGM and Margay enjoying 4 wins apiece at the World Center of Racing. Elite Chassis wound up with 3 wins at Daytona, while Owl, CRG, Ital Kart, and Parolin claimed 2 wins apiece. Single national event wins also went to PVP, Praga, and Sodi Kart. CKI looks to maintain their momentum March 10-12, when the series moves on to Roebling Road Raceway in Savannah, Georgia for stop #2 on the national program. Ironically, the stop also includes the series annual awards presentation at The Mighty Eighth Air Force Museum Friday March 10, following practice, where CKI will receive their 2016 Manufacturers Championship Award. Seating is limited to 120 people. So be sure and place your reservations as soon as possible. To view the current Road Race Chassis Standings, CLICK HERE. To view the Banquet Form for the Road Race Series, and make your reservations, CLICK HERE. CONCORD, NC - Following a most successful Awards Presentation, combined with stronger numbers at the seasons second event in 2016 at Roebling Road Raceway in Savannah, Georgia for the Dunlop/Xeramic National Road Race Series presented by Russell Karting, WKA Officials are proud to announce the 2016 Awards Presentation will again be returning in March to the Savannah, Georgia area. The event will again be run in conjunction with the Roebling Road Nationals March 10-12, the second stop for the 2017 series. Champions for the 2016 season, as well as many other award recipients and special honorees, will have a chance to reminisce on Friday March 10 at The Art Gallery at The National Museum of The Mighty Eighth Air Force. With an overflow crowd on hand last year, officials elected to move the awards presentation to a more spacious area, allowing for more attendees. A full buffet dinner, catered by Barnes Restaurants and Catering, will be available, along with a Cash Bar, as alcohol will not be allowed to be brought into the hall. To reserve seating, call the WKA Office at (704) 455-1606, mail, scan or fax the Banquet Form to WKA. To view the Banquet Form, CLICK HERE. CONCORD, NC- The battle for supremacy in the Dunlop/Xeramic National Road Race Series concluded for the 2016 recently at the Atlanta Motorsports Park in Dawsonville, Georgia. And while the rain shortened event provided a perfect summation to the season, that didn’t sway the positive spirit, nor high intensity for all competitors on and off the track. Leading the way in the title category was Matt Michel. After suffering through a horrific crash in December at Daytona, Michel roared back to life with a vengeance, taking the CKI sponsored Yamaha Sportsman Medium class by 148 tallies over David Lee, who in turn edged Amanda Holewski by just 2 points for the runner-up spot. Michel also conquered the Yamaha Sportsman Heavy class, again edging Lee, with Bill Holder rounding out the top 3. Michel wasn’t the only double titlist, as Stephen Wheatley, Louie Magiera, and Cole Peschang checked in for a pair of 2016 titles as well. Wheatley’s double dip came in the Hoosier Racing Tire Animal Lite class, where he bested Rob Hindery by 55 points, with Blake Beattie, Ben Thomason, and David Clevenger rounding out the top 5. Wheatley also laid claim to the Animal Medium class, topping Quentin Hill, Robert Wimmer, Rob Garland Jr, and Zach Linsell. For long time veteran Louie Magiera, the titles came for the New Englander in the Yamaha Sprint and WKA Sprint categories, while up and comer Cole Peschang from the Midwest took down the Junior Animal Lite and Heavy top honors. Steve Gore came away with the top honors this season in the Kion/Linde Forklifts Yamaha Heavy class, besting David McCauley and Ryan Hatcher, while Lamar Hilliard claimed a title this season in the Foster 4J Ranch Yamaha Medium category, topping McCauley and Hatcher as well. In The Agile Group Unlimited class, Jeff Standridge took the top honors for the year over Ron Miller and Darrin Cuthbertson, while Emmit Rodriguez was the champion in the West Texas Outlaws TaG Heavy division. The WT Racing Leopard Sprint class again saw good competition this year with Robert Wimmer edging Jeff Troup, Donald Nelson, Quincy Smith, and Jesse Holt for the top honors. Stephen Flatt joined the list of drivers celebrating a title this year, taking the Fisher Racing Engines Stock Honda class, besting Steven Rougeou, Chris Hines, Aamir Hyder, and Keith Buffo. In the KALL Racing/Millers Dynotime Racing Formula 100 class, Travis Miller won the battle over Lance Yunck, with Michael Tracy, Scott Campbell, and Rick Fulks completing the top 5. And Bill Morsberger laid claim to the Matthai Material Handling 100cc Piston Port Class for the season, taking the title over John Brown. On behalf of the World Karting Association, our sincerest congratulations to all the national champions, as well as all participants in the 2016 season. Special thanks to Jim Russell Jr of Russell Karting Specialites, the entire list of sponsors for the year, as well as the Southern Kart Club, Woodbridge Kart Club, and the many officials who take time away from their personal lives to help make the Road Race program truly one of the best places to be on a weekend. While the season will kick off, as always at Daytona for KartWeek, the annual awards presentation will be announced shortly. Entry information for Daytona KartWeek will be out shortly.